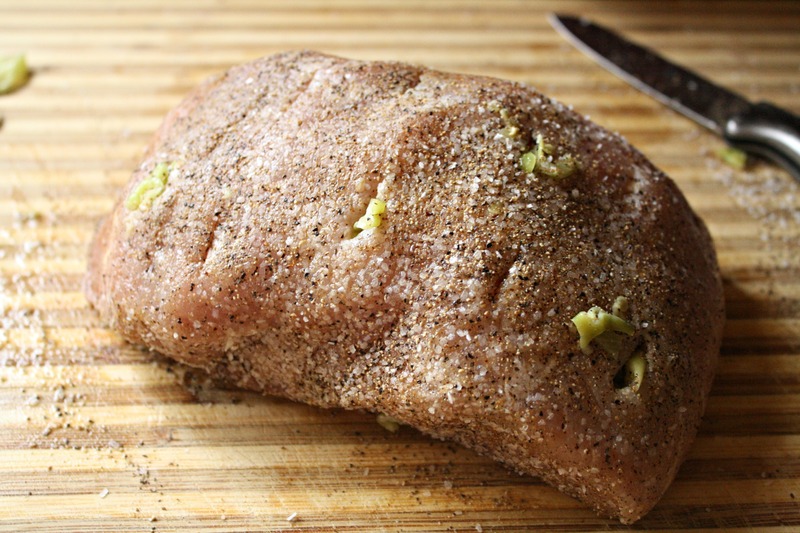 Pork roast is one of the staples in my freezer. It’s something I grew up on and have continued to share with my family. A quick search on Pinterest or Tastespotting will reveal that it’s also a beautifully blank canvas on which you can create a variety of tastes. Make it sweet, make it spicy. Make it stuffed, make it saucy. Occasionally I’ll branch out and try these variations, but usually I stick to the slightly adapted version of my mom’s tried-and-true recipe. It’s pretty easy, and because I use a crock pot it’s one of those “set it and forget it” type meals that are perfect for busy weekdays or hectic holiday weekends. Also, it’s great for when you’re feeling stabby. You’ll see why in a bit. 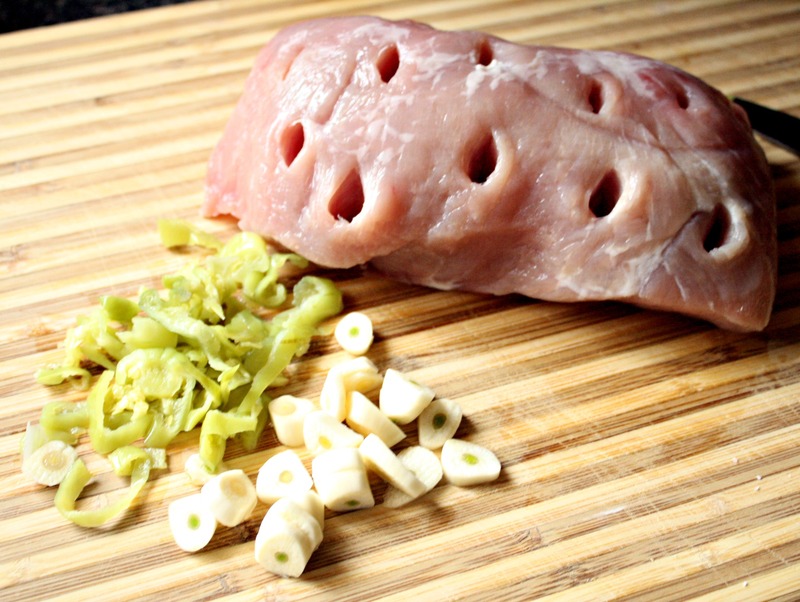 Start with a fresh or defrosted pork roast, whichever cut you prefer. This time, I had a sirloin roast in the freezer. Stab your roast repeatedly on all sides. This is great for relieving holiday frustrations. Stuff each hole with alternating garlic and pepper slices, then liberally coat with seasoning salt and pepper. This time, I used Cavender’s Greek seasoning (this stuff is amazing and I put it on just about anything), kosher salt and black pepper. Heat oil in a skillet and sear all sides of the roast. Place the sliced onions in the bottom of the crock pot, set the roast on top and pour the water or broth (I used some leftover veggie broth) over the top. Cover and cook on low for at least 4 hours or until a meat thermometer reads 145 degrees Fahrenheit. I left this one to cook for about 6 hours, and it was fall-apart tender. It’s traditional in my family to thicken the gravy with a tiny bit of cornstarch slurry and to serve with rice and some kind of greens. Check out Glory canned vegetables if you get a chance, they’re my favorite when I’m too lazy to make a side dish from scratch. I would weigh 200 pounds if I lived with you! If you pick a peck of pickled peppers…would you have enough for this recipe? A peck is surely a lot of peppers! Yum. 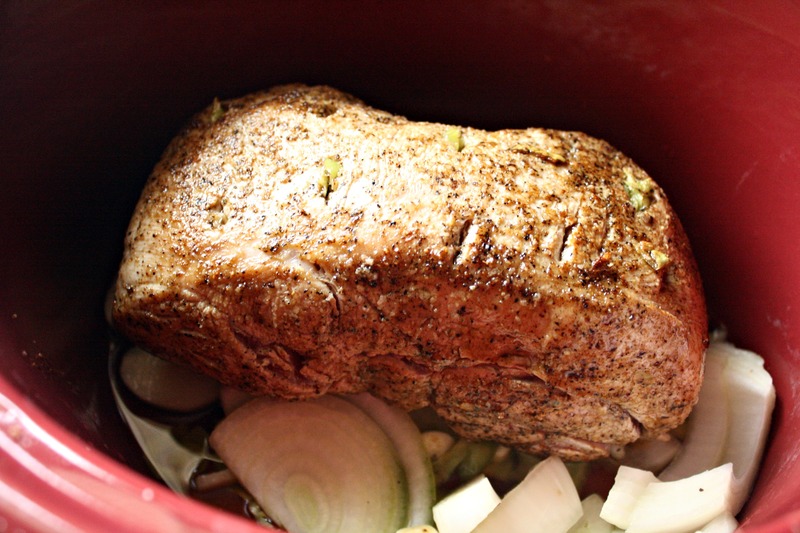 I love love love roast in the crock pot, and you’re right…it’s so easy. I don’t stab mine, but I should. It’s too much fun/relief to not be doing it! I recommend the stabbing. I also recommend a big crockpot. Mine is way too small for a sufficient amount of yummy. I’d say I’m so in love with you but chickadee will get mad so let’s just say that I’ll be stalking you at night and licking your car obsessively. Careful, your tongue might stick to it. It’s cold out thurrrr. I love, love, love Cavendars seasonings. If the taste of anything you are cooking is missing something, dash some Cavendars in it and it will be on point! And Cavendar’s… I even love it on SALAD greens!!! My Grammy introduced me to that stuff too! ha ha! I would be so pumped to be your neighbor! Grammy is a smart lady! Cavender’s and Glory veggies? Are you sure you’re not some South Florida friend of mine? Love’em!!! All I want to do when I read your recipes and cooking posts is come over for dinner. You’re not so far from Austin! It looks delicious. I’ve never stuffed my roast and am now anxious to try it. I hope since everyone can’t fit around my table that they’ll be inspired to cook some of this stuff themselves! That looks delish! And seriously, I live for Cavender’s Greek Seasoning as well – I put it on everything too. Salmon & scallops on the grill with Cavender’s – to die for. Oooh, that’s a good idea! I’ll have to try that…when it warms up. Why did I not think of punching holes in my roast for garlic?! We all get stabby from time to time, right? I need to come over for dinner. The offer always stands. 🙂 As long as you bring cocktails. Yum…. I’d fill all those holes with garlic instead of peppers because nobody at my house likes them. But if you were to come over and make it for me I’d try it! They’d never notice the peppers, really. Especially if you pick them out before you serve the plates. 🙂 I cook with mushrooms a lot, which my husband hates. I always pick them out and he never notices. What time will it be ready? That is a good stabby recipe! It’s win-win: relieve your frustrations and get dinner on the table. Brilliant!